DDRI-65-03.An all new 'VERSATILE' space efficient, elegant looking, sturdy and compact system for insect storage supported with care, safety-privacy vis-à-vis being compact to accommodate large quantity in less space, easy to handle, convenient to monitor-sort. Use of these systems increases storage capacity, as the operator opens only the aisle which has to be accessible. This system is suitable particularly for institutions, libraries and in companies where the volume of stored material is ever growing. Mobile racks consist of a set of shelf racks that is mounted on mobile undercarriages. Rack trucks travel on rails built in to the floor. 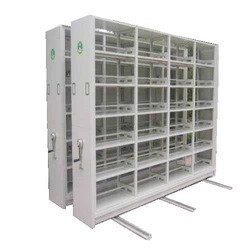 In order to attain maximum satisfaction in the market, we are affianced in proffering excellent quality range of Mobile Storage Rack in much design. •: Easy access to any material with flexible control. •: Single locking system for duet free and secured storage. •: Suitable for low height buildings with large inventory. We are offering Mobile Storage Compactors, which are made using high grade raw material to ensure durability and quality. The flexibility we offer ranges from open shelf filing closed office cupboards, drawer systems, lockers etc, a product designed to cater specific storage needs. 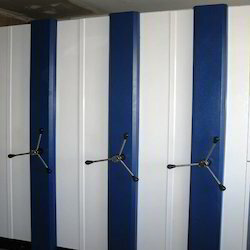 These are fitted with moving storage units mounted on rails, which further ensure its smooth functioning. Customized solution tailor-made as per requirements. We are offering Storage Compactor Systems. These racks are known for their compliance with the international quality standards and features like durability, high load bearing capacity, corrosion resistance and spacious nature. Added convenience for hinged doors, push to open from Hettich. Exacting manufacturers now have new ways of securing a design edge from furniture fronts without handle elements while offering significant added value in the convenience stakes. Push to open for doors that open easily and reliably at the mere press of a finger. More in furniture with Hettich.